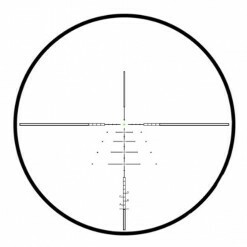 A Mil-Dot reticle or milliradian-dot reticle is the reticle you should use to be able to estimate the distances at a glance. Reticle dots serve as markers for the comparative distance between you and your target. The ‘Mil” in “Mil-Dot” means “milliradian”. The radian is a dimensionless measure, which is equivalent to degrees and points out the distance around a circle you have gone. The mil-dot reticle is based on the measurement unit of the milliradian. The dots and spacing between them are also related to it. Such a characteristic allows the rifleman to estimate the distance to the desired target of known height or width. The height of the target in yards divided by the height of the target in milliradians multiplied by 1000 equals the distance to the target in yards. The distance from the center of one dot to the center of the other one is equal to 1 milliradian. The length of a dot equals 1/4 milliradian or 3/4 MOA. The “dots” on the vertical crosshair run oblong in the vertical direction. The dots on the horizontal crosshair run oblong in the horizontal direction. 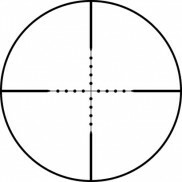 The Mil-Dot reticle is thicker towards the edges and has thin lines in the middle where dots and the crosshair are situated. The distance between the opposite thick lines is 10 milliradians. Needless to say that rifle scopes with Mil-Dot reticles gained a wide popularity and still receive a lot of positive customer reviews. The main advantage of such scopes is that they can hold windage and elevation adjustments at a certain number of dots based on wind speed/range without making any new adjustments every time. This is also an immediate cause of hunters looking for the new better models of the Mil-Dot rifle scopes. This Mil-Dot rifle scope brings a lot to the table when talking about quality aspects. Purchasing the one will make the usage of your rifle even more enjoyable. The list of all-around features, solid construction, and the most accurate optics will help you achieve the best hunting results during any time of the day or weather conditions. The most significant advantages of the rifle scope include fully multi-coated lenses and a dual illuminated reticle, providing you with an incredible light transmission, crystal clear view and bright resolution in low light conditions, either at dawn or dusk. The Sidewinder possesses 3-12x magnification and a Side Focusing System allowing the scope to parallax from the distance of 10 yards to infinity. Besides, the rifle scope is highly resistant to recoil and nitrogen-filled, which guarantees the scope to stay fog- and waterproof even in moist conditions. As a bonus, you will receive a sunshade, 100mm side wheel, and screw-in lens covers. Check most recent customers’ reviews on Amazon! This one is another Mil-Dot scope ready to compete with the others for the title of the best Mil-Dot rifle scope represented nowadays in the market. The scope was made based on responses from law enforcement and military experts to combine perfect shooting features with a laconic visual appearance. All the scopes in the line of Bushnell Elite Tactical rifle scopes feature UltraWide Band Coating (which has an anti-reflection effect) to offer the best light transmission and brightness from the front glass to the eyepiece plus Rainguard HD lens coating, which ensures to have a clear view in any weather conditions. 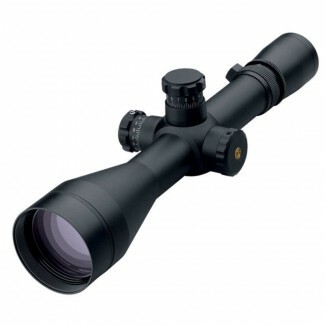 In addition, this rifle scope is filled with argon gas to provide a long-life trustworthiness. The 3-inch sunshade is included in the package and comes for free. Buying Bushnell Elite Tactical Mil-Dot SFP Reticle LRS Rifle scope you can be fully confident that it will not let you down in any situation. The last in our list of the best Mil-Dot scopes, but definitely not the worst, is Leupold Mark 4 ER/T 4.5-14×50 rifle scope. 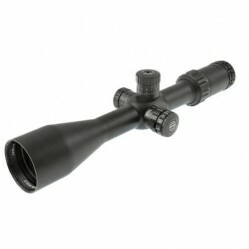 Except for a Leupold ‘s Tactical Milling Reticle (TMR), this rifle scope was designed to have all the best available features that allow you to take advantage of the power range and hit any long-range target due to its extended magnification (4.5-14x zooming) and generous level of elevation and windage adjustment. The scope was developed specially for hunting, tactical and competitive shooting that require precise accuracy even at long distances. 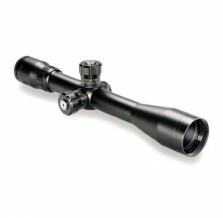 The accuracy of this rifle scope will surely serve all your needs and demands at even the most extreme distances. You can check the price and shipping on Amazon by following this link!